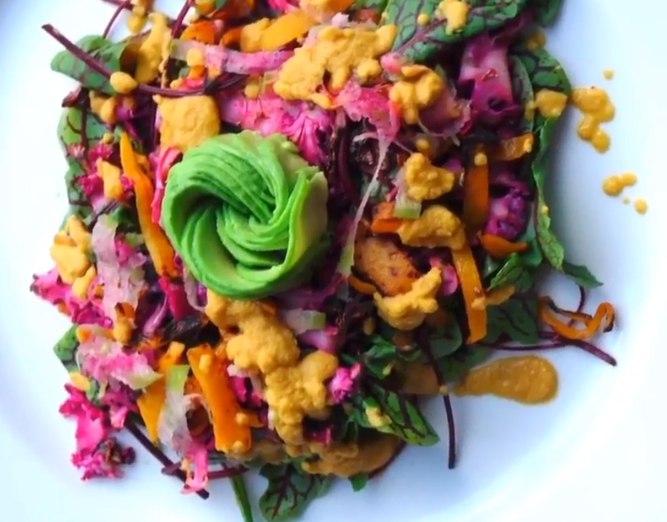 Last year, Omstars teamed up with Sahara Rose and Bhakti Chai for the #EatLikeAYogi challenge. Through this challenge, we had a goal to raise funds for the non-profit organization, OneProsper, in effort to help them support young girls living in the Thar Desert of India. 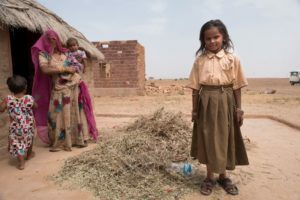 We are pleased to announce that through this incredible challenge, we were able to raise a total of $5,000 for OneProsper, which enabled them to sponsor 10 girls living in the Thar Desert of India. By March 2019, these girls will start attending school rather than walking 5-7 hours per day to collect water. This is an amazing feat, and we couldn’t have done it without the support of our amazing community of yogis. Thank you so much for your helping us achieve this goal! One of the girls sponsored by OneProper is called Gita. At the beginning of the program, back in August of 2017, Gita would accompany her mother in walking hours each day in the searing desert heat to collect water. 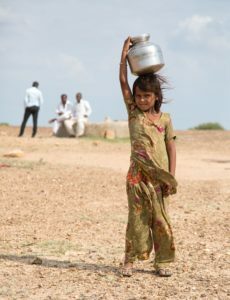 Gita and her siblings frequently faced stomach pains as a result of drinking dirty water. Together, this family lived in a basic shelter made from tree branches and four poles. Most importantly, Gita was not able to attend school because she was busy helping her mother to collect water and complete chores. Thanks to your support, OneProsper has built a rainwater harvesting tank with a bio sand filter for Gita’s family. Gita received a bicycle, school supplies and tuition to attend school. OneProsper provided Gita’s mother with seeds and training to grow crops for nutrition and income. Today, Gita’s life is filled with books. She attends school on a daily basis thanks to a brand-new rainwater harvesting tank and bio sand filter. Free from walking hours to collect water, Gita’s mother has found work and is building a new home made of bricks. What a wonderful accomplishment for this beautiful family. We are so honored to have had the opportunity to support Gita and her family, plus the 9 others just like them. Unfortunately, this work is not over yet. There are countless other families out there, just like Gita’s, who need our support. Knowing this, Omstars has plans to team up with OneProsper for another challenge at some point this year. Stay tuned. How much do you know about Ayurveda – Yoga’s sister science? 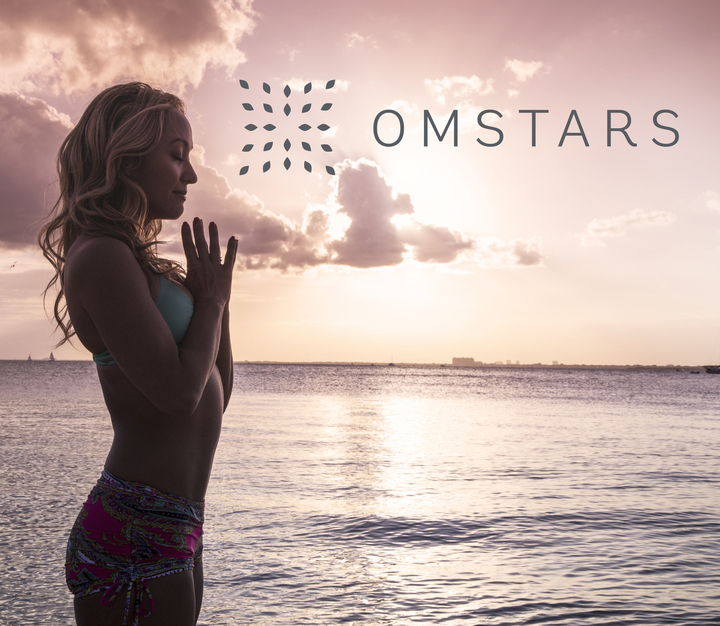 Did you know that it can help you find balance, optimal health, and even help you become your highest self? And did you know that when combined with Yoga, this powerful system for healing becomes even stronger? That’s why Kino and Sahara Rose decided to team up for the #EatLikeAYogi Challenge – to teach us how to bring yoga and Ayurveda back together, as they were meant to be practiced. Yoga and Ayurveda are great tools for helping us find balance, optimal health and wellbeing, and not to mention, accessing our highest selves; but only if we incorporate practices that cater to our needs as individuals – more specifically, our imbalances. That’s where the Doshas come in. If you already know your primary dosha and where your imbalances are coming from, then you’re in a good place to start working back toward balance. 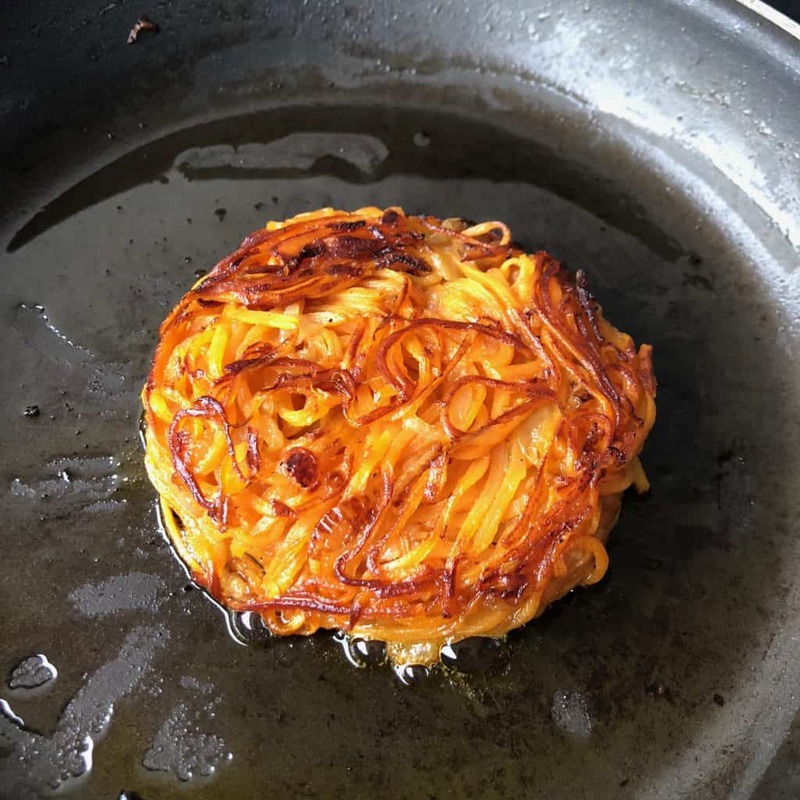 If not, the #EatLikeAYogi Challenge is designed to help you learn. Throughout the challenge, Sahara Rose teaches us how to identify our primary doshas, and which doshas may be out of balance. She offers practices that we can use to come back to a place of equanimity, including specifications based on which dosha needs to be addressed. Ayurveda is only one piece of the equation, however. 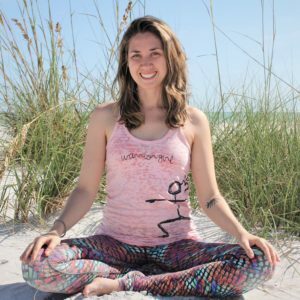 Our yoga practices can also help us find balance, and for this challenge, Kino has chosen 14 yoga poses to compliment the practices from Ayurveda. Today, we’re taking an in depth look at the Pitta balancing poses featured in the challenge. Prasarita Padottanasana A – This deep forward fold helps to cool the fires of pitta imbalance. Mid-day – the pitta time of day – is a good time to take a brake and give this pose a try. But remember, in order to balance pitta, we need to be soft in our efforts, so try not to over-stretch or push yourself too much. Just allow your body to fold forward softly, and let gravity do the work. Baddha Konasana – Those of us who are pitta dominant or who may be struggling with a pitta imbalance tend to be overactive and on-the-go, all the time. We find it difficult to sit down for rest or to do anything we feel is not productive. That’s one of the reasons why yoga is great for balancing pitta aggravation. But we have to approach our practices gently, with an intention to slow down. Seated postures like Baddha Konasana are great for giving us the opportunity to do just that. Give this pose a try with Kino on The Encyclopedia of Yoga to learn how to practice this pose properly and in a way that will help you balance your pitta dosha. Meditation/Padmasana – Meditation and breath work are great for bringing balance to an overactive pitta dosha. Simply taking a breath in, can bring cooling energy to the body, while a breath out will release excess heat. When sitting down for meditation as a means of calming your pitta imbalance, choose a simple, easy and comfortable seat that doesn’t cause any unnecessary discomfort in your body. This will give you the best results. If Padmasana is easily accessible for you, then great – if not, Sukasana is a better option. As for the kind of meditation you want to engage in, pittas can benefit greatly by meditating on images of water or the cooling sensation of the breath in. Sarvangasana/Viparita Karani – All inversions are cooling in nature, which makes them great postures for managing a pitta imbalance. Kino recommends legs up the wall in particular simply because it allows for the greatest amount of ease. This pose gives you the opportunity to soften and relax the entire body while maintaining enough elevation in the hips to still be considered an inversion. If you’re feeling overheated, irritated, angry, or any other sort of pitta aggravation, give this pose a try. Ready to start incorporating these poses into your daily life and practice? Combined with the recipes and self-care routines recommended by Sahara Rose, these poses will help you find your way back to optimal health and balance in no time.